Old Buffalo Farm barn after fire. Photo courtesy of Fire District 7. Just before 1:29 pm on Friday afternoon, August 25, 2017, a single engine was dispatched to a report of a fire at the intersection of 132nd St SE and 39th Ave SE. When they arrived they found an active, fast moving brush fire and requested an additional engine. Battalion 16 responded as well. Upon further investigation of the fire, Battalion 16 upgraded the response to a commercial fire. The battalion upgraded to a commercial fire response due to the exposure to the adjacent neighborhood and new five-story building construction nearby. The brush fire was wind aided and continued to spread catching an abandoned building on fire. This was later identified to be the old Buffalo Farm barn. Crews worked to create a control line to prevent the fire from spreading further. Due to the wind changing direction and the threat of the fire spreading to additional structures, command upgraded the response to a second alarm. Firefighters from Fire District 7, Fire District 1, and Everett Fire worked aggressively to extinguish the flames. Additionally, a backhoe from the construction company was able to quickly cut a fire line to stop the spread of the fire. 132nd St SE was closed during this time between 39th Ave SE and 44th Ave SE. Fire crews stayed on scene for a few hours to mop up the area and put out hot spots. No injuries were reported. 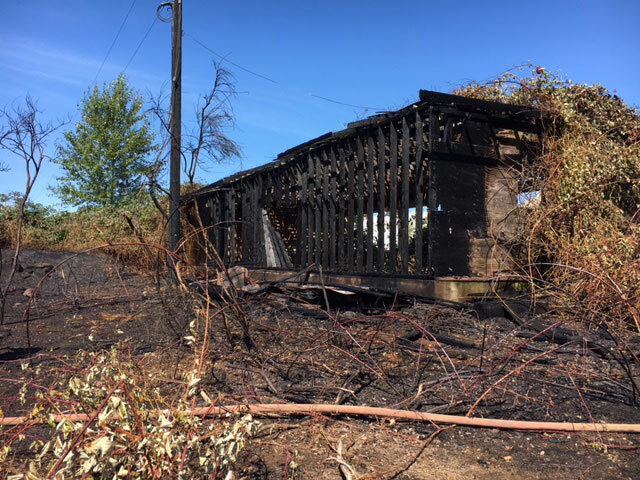 The Snohomish County Fire Marshal's Office is investigating the cause of the fire. Fire engine at brush fire on 132nd Street SE. Photo courtesy of City of Mill Creek. Firefighters mop up at Buffalo Farm barn fire. Photo courtesy of Fire District 7.